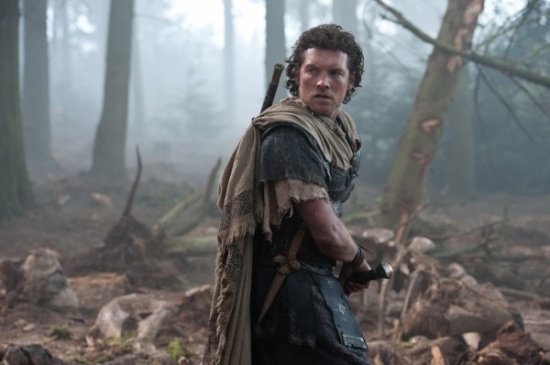 Non-actor Sam Worthington returns to ancient Greece in ‘Wrath of the Titans’. As an unwarranted sequel to a poorly received remake of a tepid ’80s fantasy flick that rates as a B-grade cult gem at best, there’s very little to justify Wrath of the Titans‘ existence. One can only assume that somebody wanted a do-over of what could have been a potentially good franchise starter. The only thing worse than a flop is an encore performance. Ubiquitous and wooden leading man Sam Worthington (Man on a Ledge) returns as Perseus, the demigod son of Zeus (Liam Neeson) who defied the gods and rejected his divine status in Clash of the Titans (2010). Persy is now a single dad dedicated to living the simple life of a fisherman and teaching his son Helios (John Bell) to be anything but a warrior. Fate, as it tends to do in epic fantasies and epic wannabes, intervenes when god of the underworld Hades (Ralph Fiennes) teams with war-god Ares (Edgar Ramirez) to betray brothers Zeus and Poseidon (Danny Bell) in a bid to wreak havoc and vengeance by releasing the tyrannical titan Kronos, from imprisonment. Perseus comes out of retirement, teams with love interest Queen Andromeda (now played by Miranda Pike) and Poseidon’s own demigod son Agenor (a comic relief role played by a woefully unfunny Toby Kebell), in order to fight evil and slay viewers’ attention spans. There’s not much more to it than that — not even enough to make Wrath an enjoyable guilty pleasure of high fantasy and elaborate action setpieces. Written by Dan Mazeau and David Leslie Johnson and directed by John Liebesman (Battle: Los Angeles), it plods aimlessly through its minimalist plot and limp dialogue from one chintzy and poorly realized sequence to the next. With nary a kraken to be released, the only fun to had with Wrath is in watching its elder statesmen — Neeson, Fiennes, and Bill Nighy (as a demented Hephaestus) — amuse themselves and each other by hamming it up big time. “Let’s have some fun, shall we?” says Zeus during the climax, as he and Hades gear up and sally forth like a pair of divine gunfighters heading for a shoot-out at the Tartarus Corral. He gets our hopes up, but by then it’s too little, too late.